In a large skillet, heat the butter and oil over medium-high heat until the butter foams. Add the Brussels sprouts and cook until lightly browned, turning once or twice and sprinkling with salt and pepper, about 5 minutes. Add the water, cover, and reduce heat to medium-low. Cook 10 minutes or until sprouts are tender but not mushy. Uncover, boil off any remaining water, and serve. Muscles from Brussels? 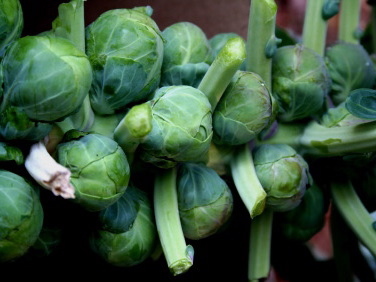 Take a look at Matthew Amster-Burton's love letter to the versatile Brussels sprout.